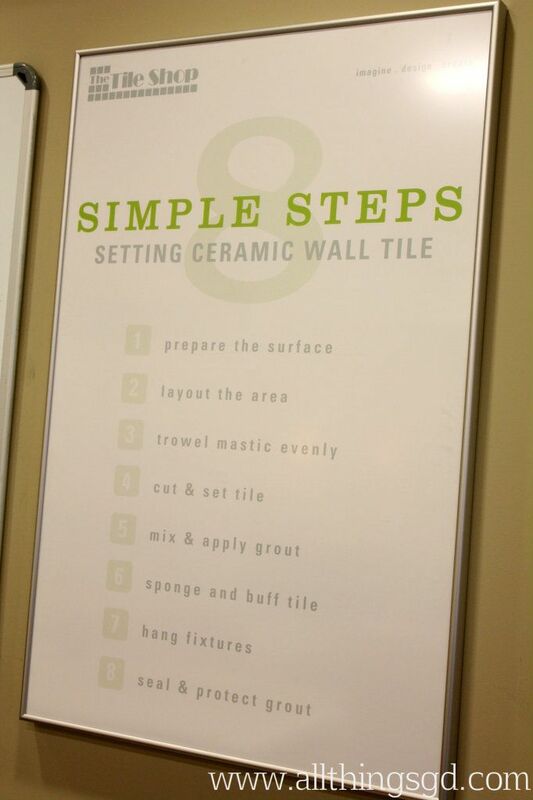 Catch up on my Tile Shop Tuesday series with my tour of The Tile Shop, posted last week! 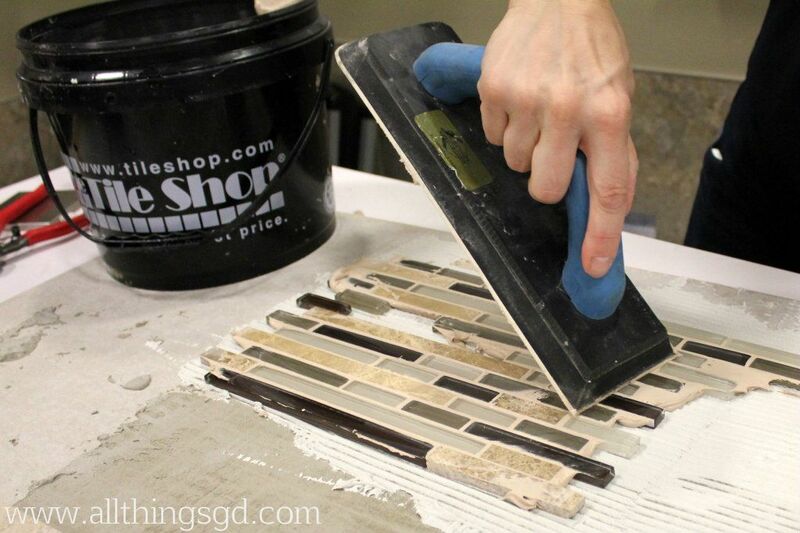 After drooling over The Tile Shop’s online store, getting tingly with excitement over my in-store visit, and selecting the perfect tile for my new do-it-myself kitchen backsplash, it was time for me to learn how to actually do it! 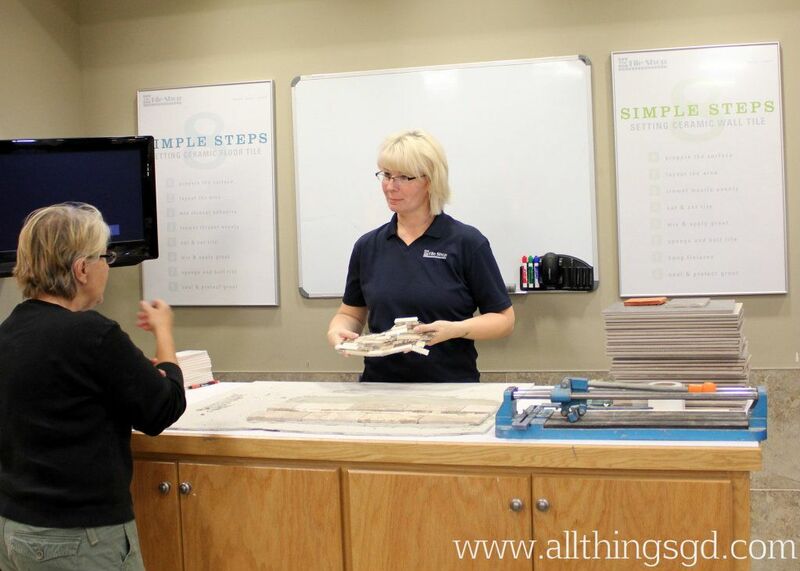 Lucky for me, The Tile Shop offers a free DIY tile class every Saturday morning at every Tile Shop location! 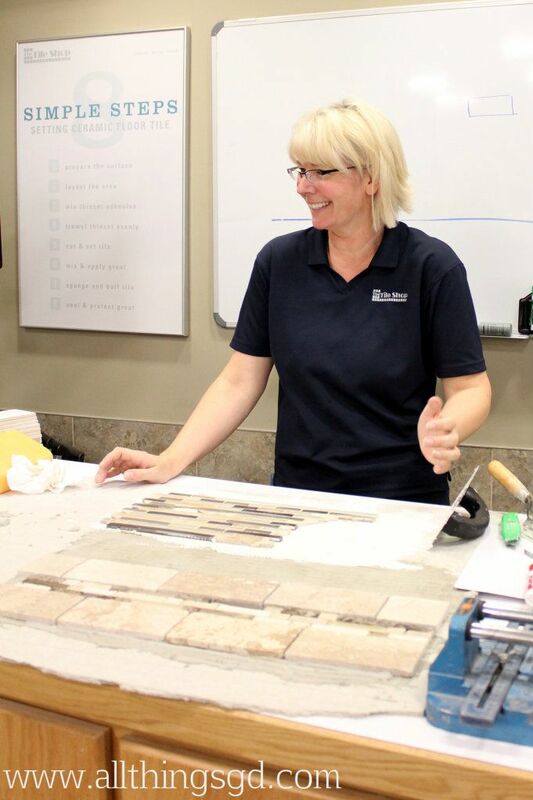 My class was taught by Lisa Cayer, store manager of my local Tile Shop, and there isn’t anything about tile this woman doesn’t know! Debbie, the other student in attendance, was also doing a kitchen backsplash, so Lisa tailored the class specifically to our projects which was such a treat! Lisa, store manager of The Tile Shop in Madison, WI teaching me and my classmate Debbie how to DIY our kitchen backsplashes! The first question Debbie and I both had was, “How the heck do you tile around those pesky outlets? 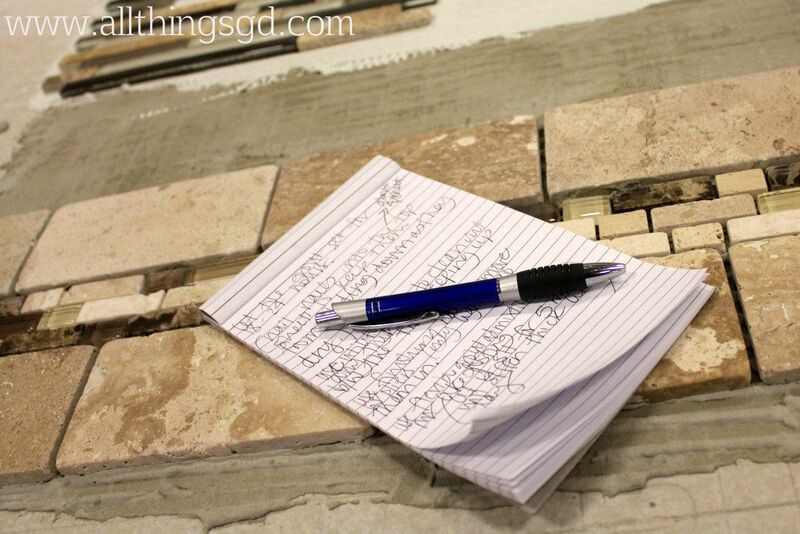 !” Lisa broke it down so well for us that I didn’t even need to look back at my notes to remember how to do it when I started my tile project a few weeks later. Once she explained (and demonstrated) it step-by-step I realized it’s surprisingly easy! Teaching us how to tile around a wall outlet. Next up, the wet saw. 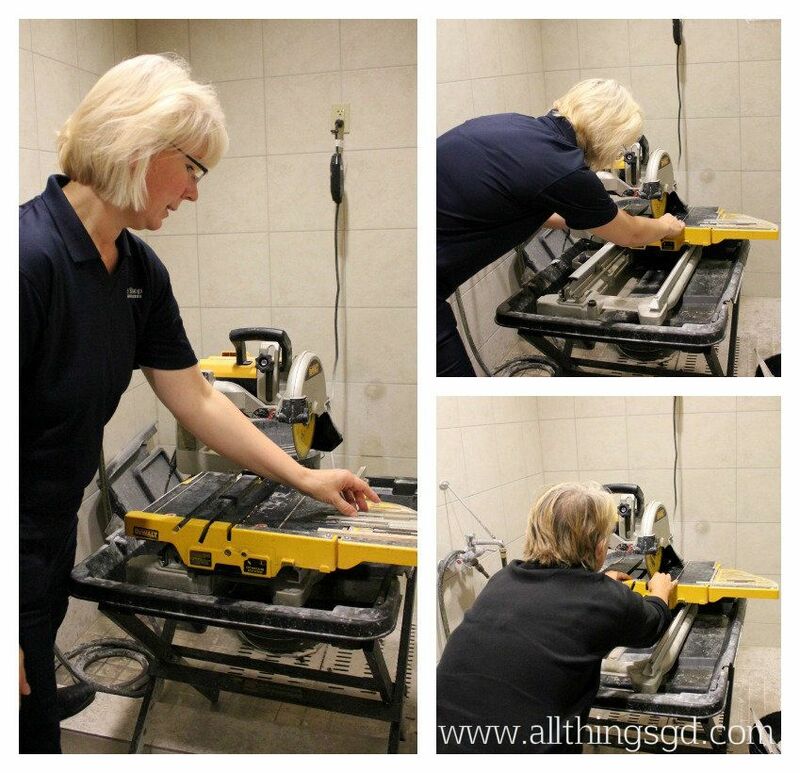 I’ll admit, I was pretty intimidated by this contraption and was already planning to pawn this job off on G – but after seeing it demonstrated (and with Debbie and I getting our own turns making tile cuts) I realized that cutting tile is even easier than tiling around wall outlets! A wet saw demonstration by Lisa, and my classmate Debbie (bottom right) taking a turn at making cuts. 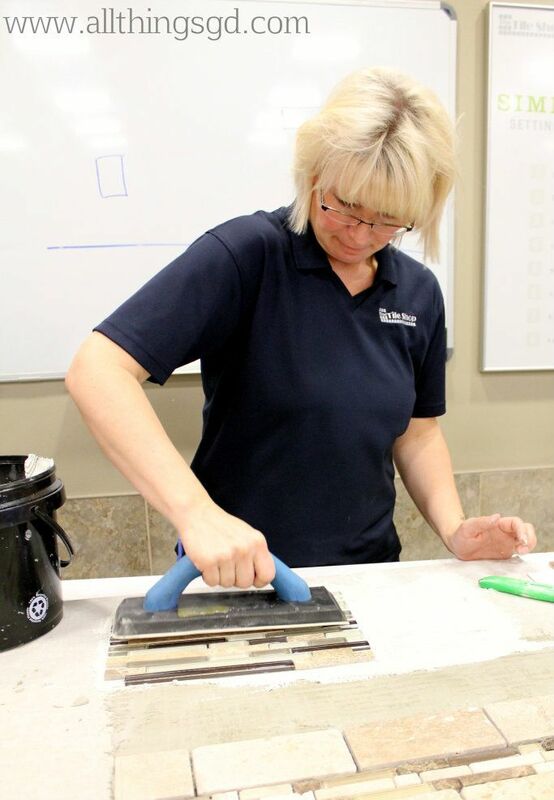 Lisa, showing us how to use tile nippers for special cuts. Lisa, showing us what to watch out for when troweling thin set. So many great tips! I was a note-taking fool! Applying grout to the tiles. Did you know there’s a certain way you should squeeze your sponge? Neither did I until I took this class! 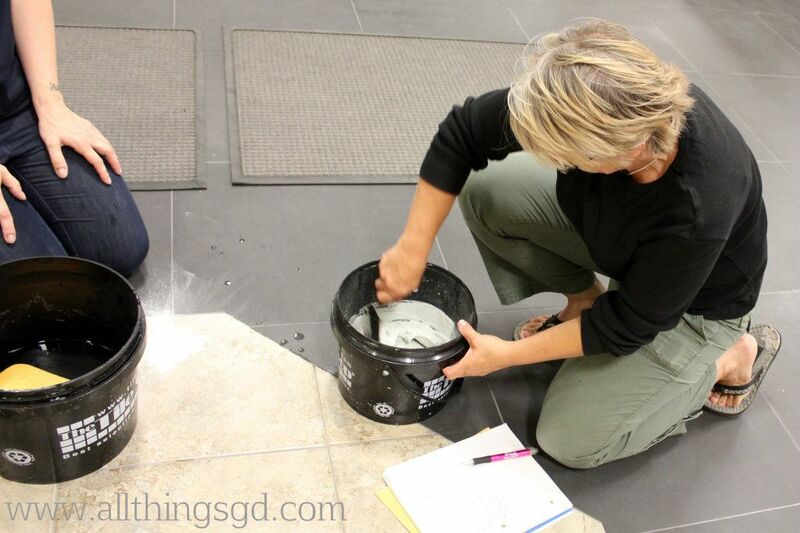 Lisa, showing us how to properly squeeze and use a sponge to go over the tile and grout. See that haze left over the tiles? Hazy grout smear marks over the tile after sponging it. Ten years ago I tackled a DIY tile floor project in the bathroom of our first house, and I remember obsessively going over and over the tile with my wet sponge trying to get all those hazy grout marks off so my tile would like nice and clean right from the start. 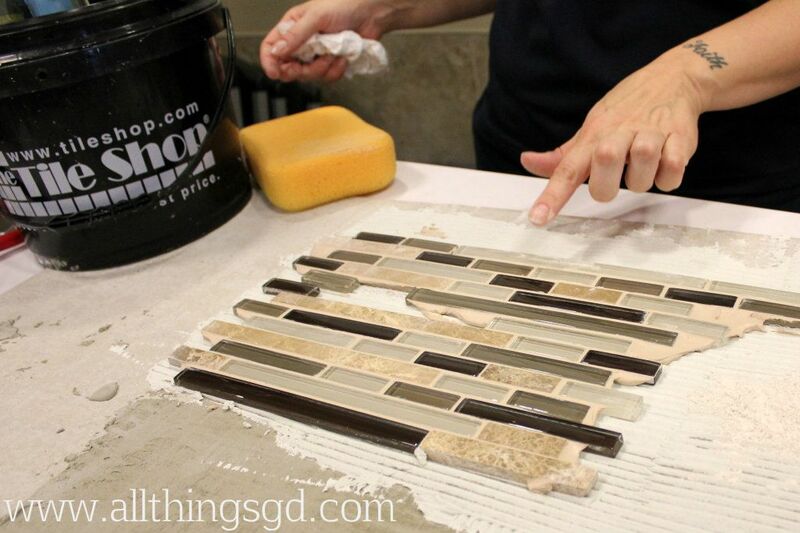 Turns out that’s the worst thing you can do to grout! 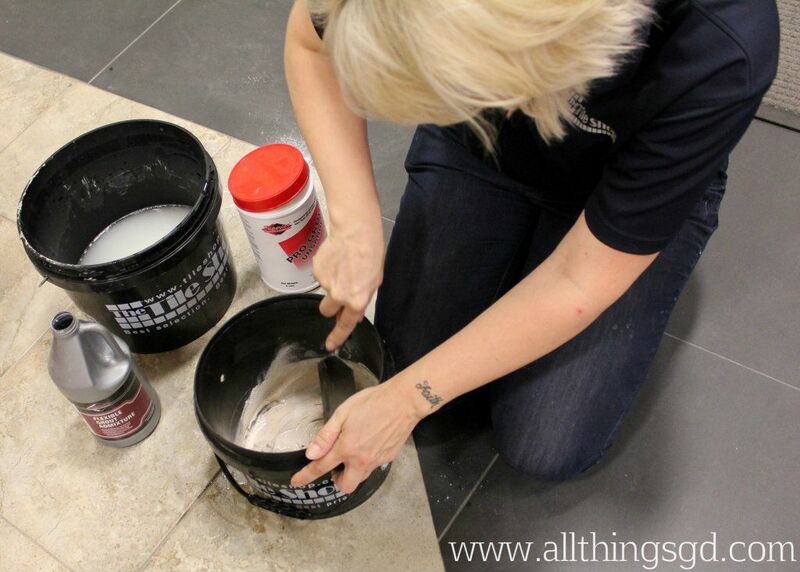 Water is grout’s enemy while it’s trying to dry, so it’s super important to only give it a couple of careful wipes with a properly squeezed sponge, and then leave it alone – haze marks hiding your pretty tile and all – until it dries. I had no idea! 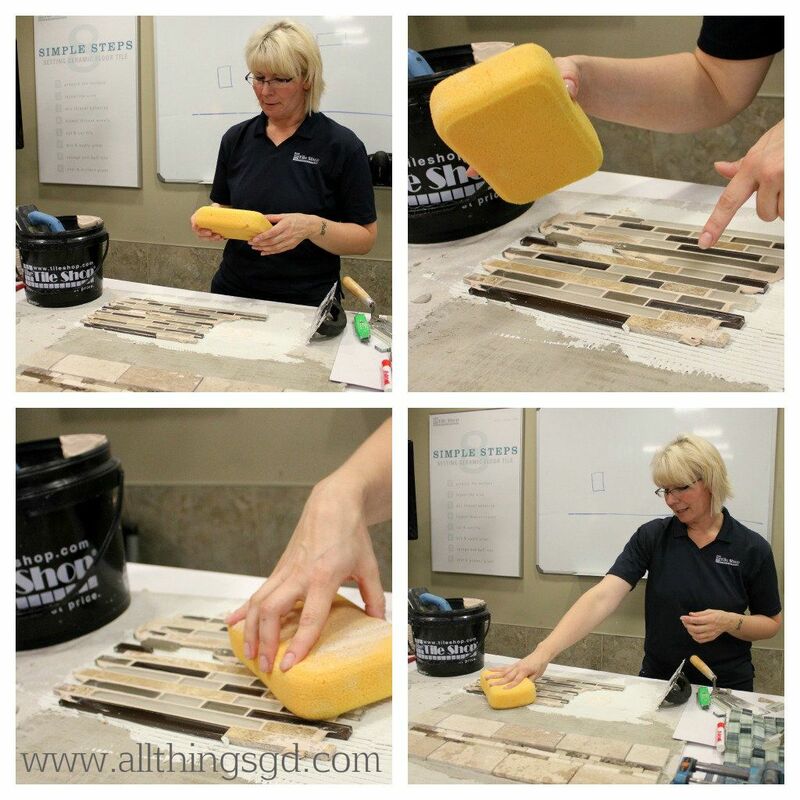 Showing us how to properly buff haze marks off tile once the grout is dry. 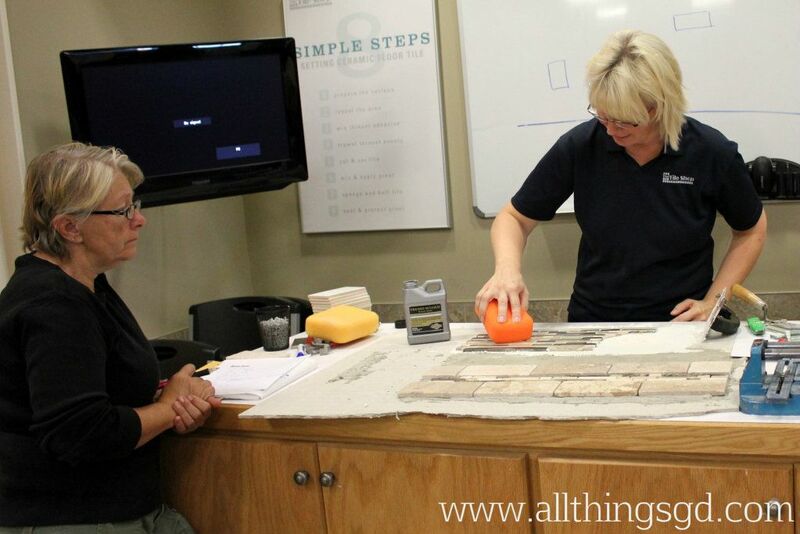 Debbie (and I) learning the proper way to seal tile and grout to protect it from stains. Lisa, answering our many, many questions with a smile! 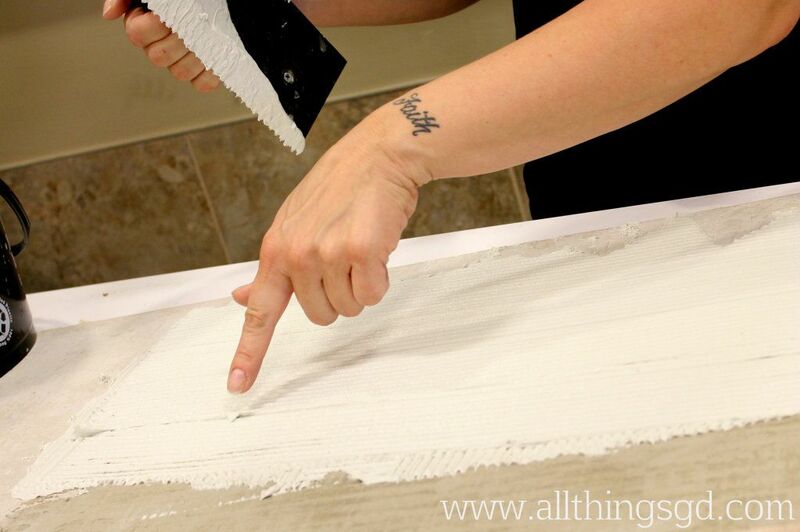 By the end of The Tile Shop’s one hour DIY tile class, I knew everything I needed to know about transforming my kitchen backsplash from drab drywall to gorgeous (and properly!) 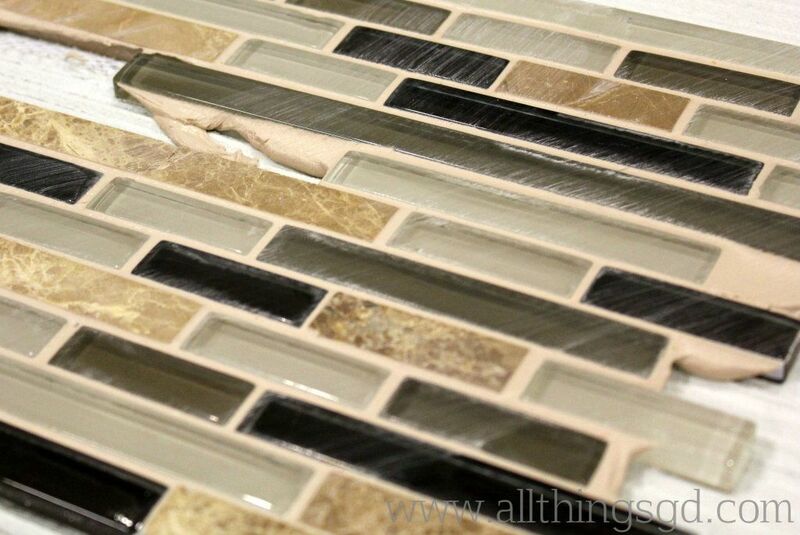 grouted tile. 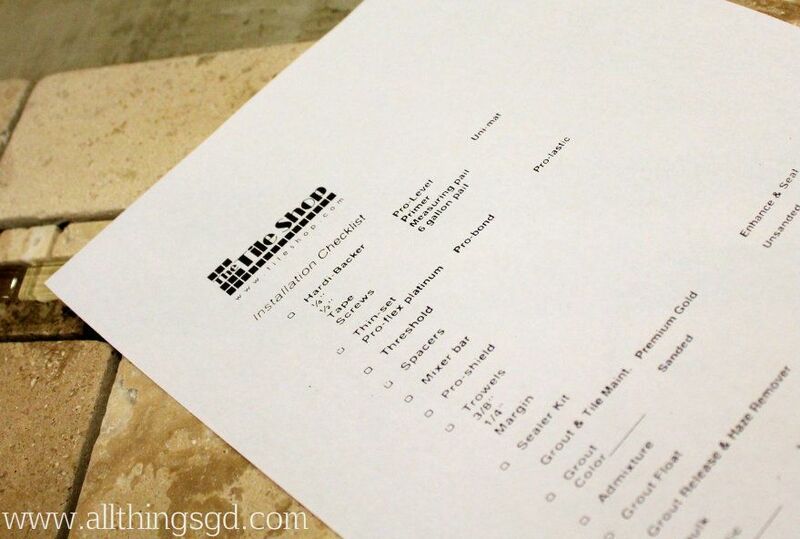 The Tile Shop checklist – ensuring you save yourself multiple trips back to the store by getting everything you need to complete your DIY project the first time! 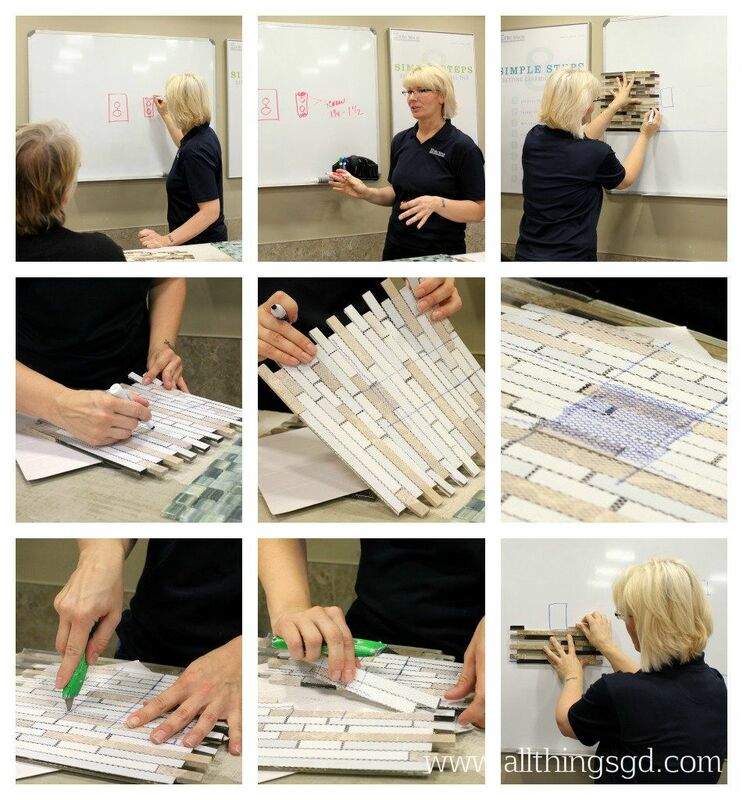 I attended a tiling class at a “big box” hardware store before attempting my first tile project (that overly sponged bathroom floor in my first house), and I learned so much more from The Tile Shop’s class. Things like tiling around an outlet and using a wet saw weren’t even mentioned in the other class I attended! I especially loved the hands-on and personalized nature of this class, and, of course, its price tag – FREE! 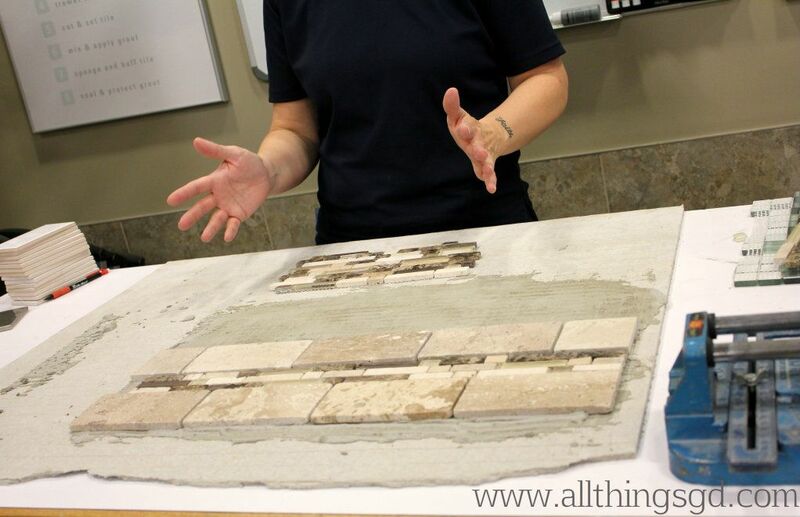 Tiling anything is a big (and pretty permanent) project, but after attending this class at The Tile Shop I’m confident that I’ve got this! Gosh, I am so envious! 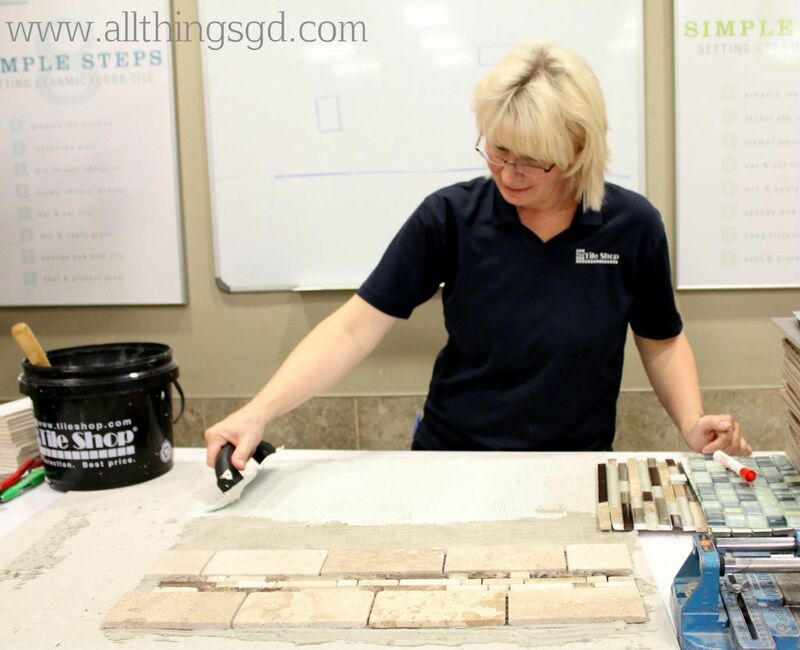 We don’t have The Tile Shop in Colorado so I am SOL when it comes to learning how to tile (hoping I can find a similar sort of class at a local place but don’t have high hopes). I’m especially obsessed with The Tile Shop since reading about your experience as well as Katie Bower’s and seeing their ads on YHL.